Severance Hall is home of the internationally renowned Cleveland Orchestra. After 80 years the orchestra’s home underwent a dramatic transformation. Before this could occur, selective stage demolition, asbestos abatement, 12,000 square feet of exterior limestone along with a two foot thick exterior wall needed to be removed to incorporate for the hall addition. The greatest challenge was to work around the schedule of the orchestra under tight deadlines. Because the building would continue hosting concerts, Precision had to ensure their activities would not disturb the employees, musicians and guests. Much of the work required laborers only equipped with hand tools to perform the work. The two foot thick wall could only be removed after the new building addition was enclosed. 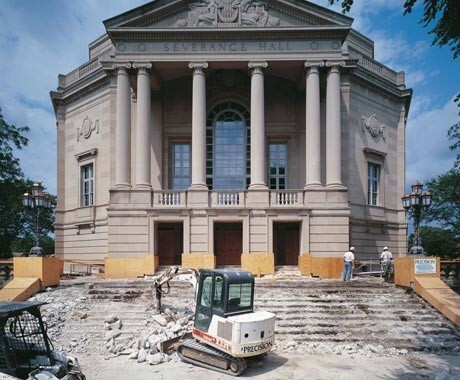 2,100 theatre seats, the sand filled stage shell and the other debris was carefully handled with no damage to the remaining historically significant finishes. Many seats were donated to non-profit groups for their extended use. The carefully sequenced project was executed over a three year period. Even through extensive length of time, the many critical periods of heightened activity were ably managed by our crews. We were very proud to be recognized for our contribution as the orchestra opened it’s new home to the public for it’s first historic performance. Asbestos abatement and selection demolition to support a dramatic transformation of Severance Hall, the home of the Cleveland Orchestra, in preparation for the millennium.